Identifying opportunities to improve mobility, safety and quality of life for everyone who lives, works and plays along Harbor Drive and in the surrounding communities. 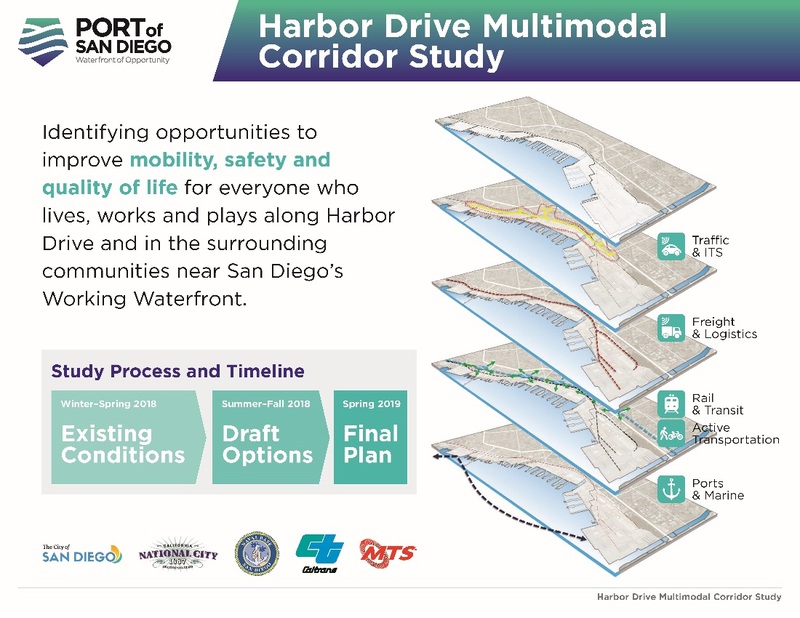 The Harbor Drive Multimodal Corridor Study is identifying opportunities to improve mobility, safety and quality of life for everyone who lives, works or plays along Harbor Drive and in the surrounding communities near San Diego’s Working Waterfront. The Harbor Drive Multimodal Corridor Study is a planning study to examine how people use Harbor Drive, address existing issues and challenges, and identify opportunities for improvement. The study focuses on the stretch of Harbor Drive between the Port of San Diego’s two cargo terminals, the Tenth Avenue Marine Terminal in San Diego and the National City Marine Terminal, known as San Diego’s Working Waterfront. The study will consider all modes of transportation used by residents, visitors and businesses in the area – foot, bicycle, passenger vehicle, bus, cargo truck, light rail, cargo rail, and vessel. The goal is to identify potential improvement projects, large and small, that could be implemented by the Port and/or other jurisdictions as funding becomes available. The Port’s objectives are to balance the costs, benefits and impacts to the community and are consistent with the Vision and Guiding Principles established as part of the Port Master Plan Update process. The study area falls within the jurisdictions of the City of San Diego, the City of National City, the U.S. Navy, the California Department of Transportation (Caltrans), the Metropolitan Transit System (MTS) and the Port of San Diego. These partners will be crucial in helping the Port evaluate existing issues, identify potential high-priority projects, and tackle future solutions together. For more information about the study or upcoming community events, please contact Laura Cuthill by email at lcuthill@portofsandiego.org or by phone at 619.725.6038.